Eating more fish could give you a bigger brain - and greater protection against diseases such as Alzheimer's, claim researchers. Shrinking brain volume is a sign of Alzheimer's disease as well as normal aging. For the US study, levels of omega-3 fatty acids including DHA in red blood cells were tested in 1,111 women who were part of the Women's Health Initiative Memory Study. Eight years later, when the women were aged around 78, MRI scans were taken to measure their brain volume. Those with higher levels of omega-3s also had a 2.7 per cent larger volume in the hippocampus area, the brain's key memory centre. In Alzheimer's disease, the hippocampus begins to shrink even before symptoms appear. Dr Pottala said: 'Our study suggests that a higher tissue reserve of omega-3 fatty acids may slow the loss of cognitive function that can accompany brain atrophy. 'It adds to growing literature suggesting that higher omega-3 tissue levels, which can be achieved by dietary changes, may hold promise for delaying cognitive ageing and/or dementia.' The best dietary source of omega 3 fatty acids is oily fish because the human body cannot produce omega-3 fatty acids. Dr Laura Phipps of Alzheimer's Research UK charity, said: 'There has been mixed evidence as to the benefits of omega-3 fish oils on the brain and whether they may protect against memory decline and dementia. 'This study suggests that higher levels of omega-3 fatty acids in blood are linked to larger brain size but the possible reasons for this association need further investigation. 'We know that the brain gets smaller in people with dementia, but it is unclear from the study what effect larger brain size would have on memory and thinking in the volunteers or their long-term risk of developing dementia. 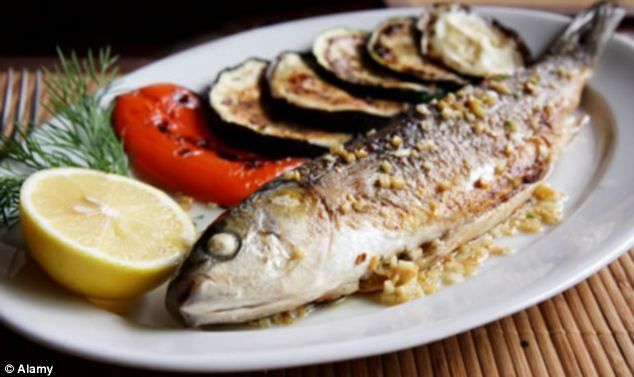 Dr Doug Brown of the Alzheimer's Society, said: 'It's interesting to see that eating more fish could lead to larger brain volume, particularly in the hippocampus - an area of the brain that comes under attack in dementia. 'We know that brain shrinkage can be linked to dementia and larger brain volumes could indicate a better ability to cope with the ravages of the condition, but it's a big leap to draw this conclusion. Chef Verati's Cookbook - Feedback Appreciated!